Ottawa has a reputation for hosting the best Canada Day party in the country, and this year’s celebrations do nothing to dispel those sentiments. Check out free performances by Feist, Simple Plan and Roch Voisine (to name a few); look to the skies over Jacques Cartier Park to see the SkyHawks perform a daring parachute demo; learn the ropes (literally) with a lasso demonstration at Major’s Hill Park, get up close and personal with the Grey Cup in Jacques Cartier Park; or just wander around downtown and revel in the high-energy atmosphere. As usual, the day’s festivities are capped off with a spectacular fireworks display at night. Chris Botti plays the Ottawa Jazz Fest on Friday. Catch Grammy Award-winning trumpeter Chris Botti perform with the NAC Orchestra, as the TD Canada Trust Ottawa International Jazz Festival comes to a close this weekend. Botti, who has sold more than three million records worldwide, has performed with iconic artists such as Frank Sinatra, Sting, Andrea Bocelli, and many more. The Unisong Canadian Choir Festival has featured over 5000 singers and 191 groups throughout its 16-year run. Presented by the Arts Bureau for the Continent, Unisong brings choristers together from across Canada during the five-day event. Nine artists will showcase contemporary pieces in “Local Flora,” an exhibit opening this weekend at SAW Gallery. The artists, all of whom are from the Ottawa and Outaouais region, will display works in painting, photography, sculpture and video-based installation that explore how nature is interpreted through artistic expression. In honour of Canada’s 144th birthday, we’ve rounded up an assortment of activities that get you in on the action, whether you’re looking for one day, or a whole weekend, of fun. Happy Canada Day! Parliament Hill is just one place to celebrate Canada Day this weekend. Photo credit: NCC/CCN. Everyone knows downtown is the place to be if you want to be in the thick of things, and everyone should experience Canada Day on the Hill at least once. Today, some of the highlights include the pageantry of the Changing of the Guard, the noon show, featuring the Duke and Duchess of Cambridge, plus musical acts from across the country, and an evening show with plenty of live entertainment. Major’s Hill Park and Jacques-Cartier Park are good places to take the family, with activities that include a VIA miniature train, kite flying, an outdoor sculpture gallery, an international village, a Great Canadian Chicken BBQ, dance classes, fireworks, and — we can’t even believe we’re saying this — so much more! Located right downtown, the National Arts Centre will be hosting an array of activities that are fun for the whole fam. If you need a breather from carousing on Parliament Hill, head here for some free fun that includes storytelling, breakdance performances by Culture Shock, music by the NAC Orchestra and 250 choiristers, plus entertainment by the Ottawa Stilt Union. Earning a visit on the Royal Tour, you know the Canadian War Museum has serious cred. While Wills and Kate will stop by here on July 2 for a private function for veterans, there’s plenty of fun programming to be had on Canada Day for the country’s grand fete. Activities include military marches and highland tunes with the museum’s “wandering piper,” temporary tank tattoos for the kids, lectures about battlefield medicine, and more. Even better? For today only admission is free. Canada Day on Parliament Hill. Photo credit: NCC/CCN. If there was ever a year to head to the capital to celebrate Canada Day this July 1, this is it! Not only is there a jam-packed line-up of entertainment (Sam Roberts and Great Big Sea being two names of note), but also the Duke and Duchess of Cambridge will be taking part in the noon show on Parliament Hill as part of their first official overseas trip as newlyweds. Other activities happening throughout the day at Major’s Hill Park and Jacques Cartier Park include dance performances, a slam-dunk show, kite-flying, and a DJ party, topped off with the spectacular fireworks show at night. So don your red and white clothes, paint a maple leaf on your face (whether you’re Canadian or not), and get ready to wish Canada a big, royal 144th birthday. On July 1 our home and native land marks its 143rd birthday. 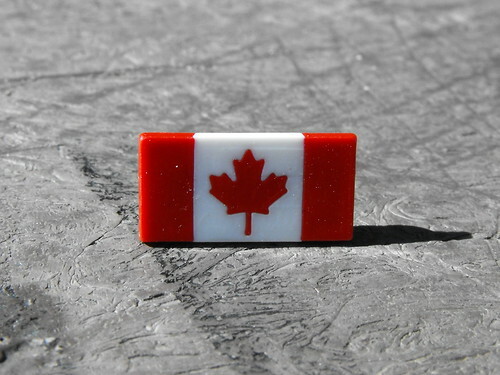 Even if you’re just adopting Canada for the day, these red and white products help you show some patriotic pride. >> 100 Photos That Changed Canada book by Mark Reid, $45, Indigo. >> Maple leaf key holder, $63, Swarovski. >> Canadian Shield T-shirt, $32.50, Red Canoe. >> Village Bag International, $158, Roots. >> xcase Nation carry-on suitcase, $99.97, The Bay.